This LP is the first USA album to release the 'RAH' show. It was also issued as a single. You may choose to follow the LP Variations link for more info on this LP; or click the icon to continue the tour. A 1970 release on the Zerocks Label, this is the first LP of the RAH show to be released in the United States. The cover on this piece leaves lots to be desired. The front cover loose line sketch looks very little if any like Bob. 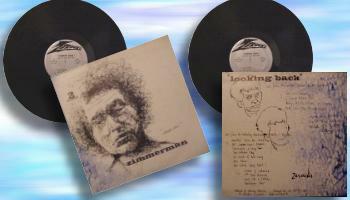 As the L.P. is credited to Zimmerman with no mention of Dylan anywhere, perhaps the Zerocks Label was going for complete anonymity even down to the drawing. Back cover lists songs written in a free-hand style that's sometimes hard to read. A big poo-poo for the cover effort. Inside everything changes. Nicely done full printed labels. Good, heavy vinyl...great sound. Side three and Four is listed as the Berkeley concert. In reality, side three is from Town Hall '63. Side four is from the Adelphi theatre, Dublin '66. also available on Mood Music Label and Dittolino Label. This is a confusing LP as it was released in so many variations. LP Variations.